At the start of the year, Alastair Humphreys called for people to live more adventurously in 2015, challenging us to spend a night out in the wild, once a month for the year. Since that call to arms I’ve seen a rise in the number of great blog posts, videos and photos of people venturing for wild camping microadventures. There’s some great stories of adventure out there I thought I’d put together a monthly round-up of ones that caught my attention. If you think I’ve missed anyone out, or would like yours included, then leave a comment below. Allysse took to the woods of Hertfordshire (a much underrated wild camping county IMHO) for her microadventure. Allysse has included some audio of the camp on her blog, it brings you right up close to the camp, don’t miss it! Chris spent the night in an old watch tower on the Finnish – Russian border. Yes, you read that correctly, the Finnish – Russion border. And from his camp he watched the shimmering northern lights. Me, envious? Most certainly! Impressed? Most definitely! Ellie and friends camped out on a hill overlooking Cardiff and sort-of saw the eclipse in the morning. Maxine went on THREE wild camp microadventures in March, one in a wood and two on a beach (one of which was with Anita, see her report below), which is pretty damn impressive in my book! the Norfolk Facebook microadventures group (of which Maxine, Anita and I are all members, is on fire at the moment with all this wild camp adventuring!). The Bimbler kept warm in his tent with an interesting looking heating contraption (and took some rather good photos). Ollie and a friend pitched up in a wood for the night. A certain Alastair Humphreys went up to a wood on a hillside for his March camp. Jonathan spent the night in a wooden three-sided shelter. Emma’s went on her first ever wild camp in Chisbury Wood, Wiltshire. (note: I’ve taken some images from the blogs for this post, if you’re a blog author and rather I didn’t use your photo let me know and I’ll remove it). 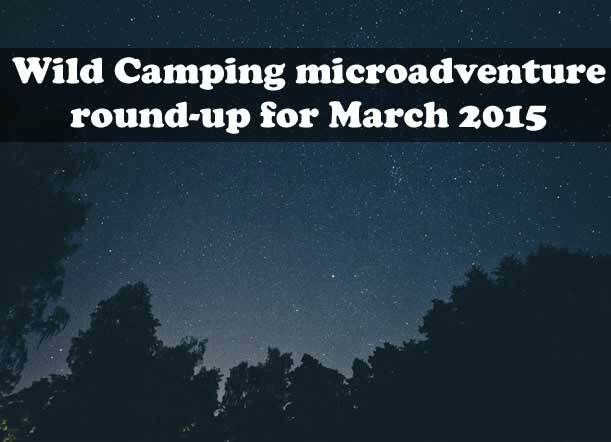 Did you manage a microadventure wild camp in March? Do you have one planned for April? Thanks again for doing the microadventure round-up! It’s great to hear everyone’s stories. Thanks for this round-up (and for adding me in)! In March I cycled in the dark up the Plym Valley Trail and bivvied under the stars on Sheepstor. Cold and clear night. In April I cycled round and across Dartmoor (80 miles) and then used a hammock for the first time in the woods above Burrator. Rocked to sleep by a strong breeze through the trees. Very comfortable. Must remember to take a spoon to eat my porridge next time! I might kayak around the coast near Newton Ferrers and sleep on the beach for the next one. Hi Dave, thanks for dropping by. Your adventures sound exciting, I love the idea of kayaking/wild camping, maybe one day. Do you have a blog at all?